Will you sell my screenplay for half of the proceeds and a shared writing credit? The short answer is, no. I won’t. I find it ironic that my entire blog is about empowering up-and-coming screenwriters with the tools and knowledge to sell their screenplays themselves but yet people think it’s a better option to just email me and see if I’ll sell it for them. Hmmmm. Now for the long answer, which will hopefully help people (and stop some of these emails!). Will you polish or rewrite my screenplay for me? Selling a screenplay is really hard. It takes a lot of time and energy. I find that I struggle to keep up with the marketing of my own screenplays, so taking on another writer’s screenplay simply isn’t feasible. There aren’t enough hours in the day for me to work on more than my own projects. 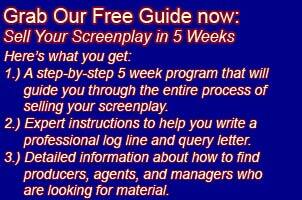 Everything I know about selling screenplays I share on this blog. Really. Absolutely everything. I’m not holding anything back. If you read my blog regularly and you go back and read older posts you will know 100% of what I know about selling screenplays. I’m certainly not the most accomplished screenwriter in the world but I have sold a few scripts. And I believe that you too can sell your own screenplay if you work at it. Hopefully my blog can help you in your pursuit. Please let me know if it does. I don’t hold the keys to your success.